Starting tomorrow, Nov. 15th and going through Dec. 15th, we are starting our annual Food for Fines program. 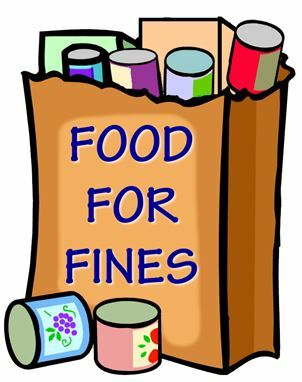 For every item of non-perishable food brought into the library, we will reduce your fine by $1.00!!! Owe $2.85? 3 cans of soup will bring it down to 0!! All items collected will go to the 1st Presbyterian Community Food Pantry. ALSO, please don’t forget we are also collecting NEW book donations for Operation Santa Claus until Nov. 30th. We need books for toddlers all the way to high schoolers…please donate to both causes!!!! THANK YOU!!! !